This is the no-brainers of all no-brainers. 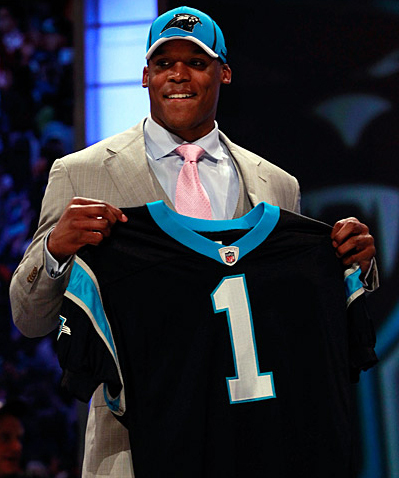 Carolina Panthers rookie QB Cam Newton has taken the NFL by storm this season. He shot down the nay-sayers. Created believers out of doubters (including yours truly). He broke records (rookie passing and QB rushing touchdowns in a season). Simply put, Newton exceeded expectations and turned a laughingstock franchise in a respectable force in the future. That is why Newton should be the NFL Rookie of the Year, and it shouldn’t be close. Sure people (namely Skip Bayless) will point out that Newton has not led his team to a winning record a la Andy Dalton (another ROY candidate) in Cincinnati – Newton’s Panthers are 6-9 while Dalton’s Bengals are 9-6 with a shot at a wild-card berth. Those same people will say that Newton has thrown more interceptions than Dalton (16 to 13). Well, I have some things that would shoot down the Dalton argument. First of all, as I mentioned earlier, Newton set records from the QB position. He broke the rookie passing record set by Peyton Manning – yes, THAT Peyton Manning. Newton has passed for 3,893 while completing 60% of his passes – not bad for a person with “accuracy issues” coming out of Auburn. Newton broke the touchdown record for QBs with 14 – which is also second highest rushing TDs in the league this season. He has rushed for 674 yards with a 5.6 yards per carry (who does that?). The second reason is one that a lot of people are not talking about. Dalton’s ROY votes will be split with A.J. Green – who is not only a rookie sensation himself, but is Dalton’s teammate. That alone should hand Newton the ROY award. This is not to poo-poo the success of Dalton. I liked the kid since he was tearing it up at TCU. Plus, I expect bigger things for him and the Bengals next season going forward. I just think that this is Newton’s award to lose. Offensive rookie of the year will go to the media hyped Newton who has done a lot with the publicity he’s received BUT Dalton has done more with the piddly amount of pub he’s received and he’s won more games..records aside…this is a team game and Dalton has a chance to take a bad team into the playoffs in his first year..Cam not so close. If Dalton played for the Saints or the Colts or a perennial team I’d agree with you completely BUT Dalton plays for a team that’s been in the playoffs maybe a handful of times in my lifetime and he plays in the AFC a top to bottom better league than the NFC. Flip a coin I’d be happy if this was a year they shared the award. I see what you are saying about Dalton (Skip Bayless on ESPN’s First Take has said the same thing many times). The main difference between Dalton and Newton is that Dalton has help on the defensive side of the ball. The Panthers’ D could not stop a nosebleed. Hell you, myself and 9 of our college friends could line up and hang 30 on them. The defensive and a piss-poor kicking game cost the Panthers at least three games this season. Also, the fact that Newton turned an offense that was ranked DFL (dead f–king last) to a top ten unit across the board – yards, scoring and first downs. He even got wide receiver Steve Smith to believe in him, which is no small feat.